The Sid Jacobson Jewish Community Center is expanding its food collection efforts into an in-house food bank, set to officially open April 7. The food bank, located in a new space for the JCC that neighbors its main building in East Hills, will stock supplies for in-need populations on the North Shore and provide an internship opportunity for participants in the JCC’s vocational training program for young people with developmental disabilities. It is one of three sites benefiting from an ongoing Sid Jacobson JCC capital campaign with a $12 million goal. The Center for Community Engagement launched in the fall of 2017, organizing Sid Jacobson JCC’s social justice efforts and volunteer efforts. It is both an educational resource and an intermediary to connect community members to opportunities to give back. The monthly donation drives are among its ongoing efforts. The JCC has existing partnerships with local organizations that distribute food. The donations are deliberate, Berman said, because the organizations specify in-demand items that the community should contribute. Having a food bank will take the JCC’s involvement further by maintaining an ongoing stock and distribution effort. “Opening a food bank has always been our vision,” Berman said. Volunteers called “bank buddies” will commit to helping stock the shelves, Berman said. Participants in the JCC’s Vocational Training and Employment Center will have the opportunity to intern at the food bank – sorting the food, making calls and making deliveries. For the interns, the food bank will be an in-house opportunity to further their employability, Berman said. The Vocational Training and Employment Center provides teenagers and young adults with developmental disabilities the opportunity to intern and work at local businesses. Using the food bank as a vocational training site sets the Sid Jacobson JCC’s food bank apart from others at Long Island JCC’s, said Director of Development Debra Wiener. “It’s really giving the interns a myriad of real systems that they have that they can work with,” Berman said of the food bank. The $12 million capital campaign, which started in 2015, is supporting the food bank, the JCC’s main building and its Bernice Jacobson Day School and Camp. “This campaign is the largest in scope out of any campaign in the JCC’s history and is the most exciting because of what it can mean for our community,” Wiener said. The JCC has already raised $7 million in the campaign, and the food bank is the most significant program to result from it thus far, Wiener said. In the JCC’s main building, there will be increased entrance security and new program spaces such as a teaching kitchen thanks to funds raised. The aquatic center was also renovated in 2015 through the campaign, Wiener said. 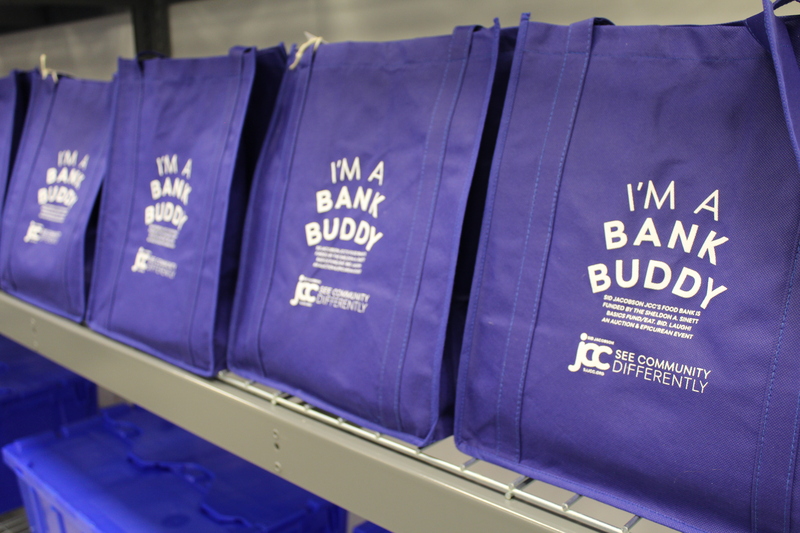 The JCC is welcoming the public to the food bank for the first time April 7 for a shelf stocking event.